Over the last year we’ve tried everything we could think of or that we came across in our research. We tried letting him help us cook the meal or taste it while we were making it, we tried to make things we thought he really liked and give in to a lack of variety, we created colorful smorgasbords on sectioned plates with fun cartoon characters, we tried dipping everything, we put lots of choices out for him or only once choice, we ended meals when he threw food, we let him have as many chances as it took, we even stooped to making junk food and found ourselves hopeful it was as easy as that. We’d be willing to turn a blind eye on our morals around food, but none of it worked. Consistently Orion still rejected many meals we presented him with. Here’s the things we found that at one time or another were mildly successful. We hope at least some of these tips and tricks are helpful to you or at least give you some company in knowing that there are other difficult eaters out there. I saw a little girl the other day sitting down with her parents at a coffee shop sweetly sipping a cup of warmed milk with nary a spill or crumb astray. I almost picked her up right then and there and ran out the door with her leaving Orion behind. 1. Try Letting Them Feed Themselves – invariably Orion enjoys eating more when he’s allowed to wield the utensils. This has been more the case as he’s gotten older since meal times are a perfect time to work on pushing boundaries/testing independence. 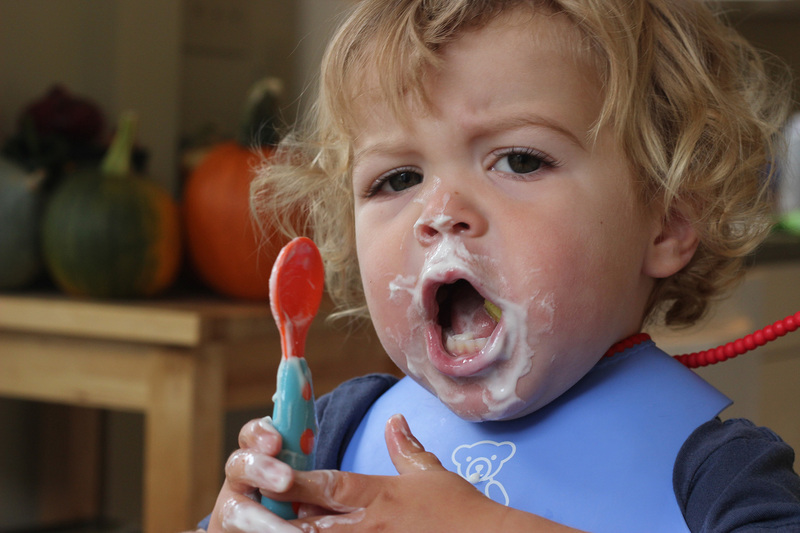 When I wield the spoon, it’s just that – me forcefully trying to shove food into his mouth. Even better try letting your kid use full sized spoons or forks like mom and dad or let them eat out of a really small or really large container. This introduces an aspect of fun that’s often lacking during meal times. 2. Eat Your Meals Together – while we really believe in trying to eat at the same time as our kid, family meals are just often not realistic given Orion’s early bed time. We’ve also found that they had no benefit in terms of improving reliability of Orion consuming food. I have been surprised several times, however, at what Orion ended up eating just because I was eating it so try making yourself whatever you want for lunch, and see if your kid gets interested instead of making the meal all about him or her. At the very least this will make sure you don’t deprive yourself the pleasure of eating your own lunch. 3. Spend Time Together But Know When to Take a Break – it goes without saying but Orion does better when we sit down at the table and really spend time with him. Why is this such a hard one? Because when your toddler is throwing the third meal option you’ve put down in front of him and smearing his greasy fingers across your clean clothes or throwing their cup of water on you, it’s very hard to maintain your composure. If meals are turning into a battleground, then take some time and space away. I found it very helpful to sometimes put myself in a time out instead of Orion. I don’t know if he understood the consequences of his actions but just a minute or two spent away from the kitchen trying just to breath really helped me. Only do this, obviously, once your kid is older/as long as you know they’re not a kid who’s likely to choke. Orion may throw food to high heaven and make a royal mess, but he’s always been really good about not choking so I feel safe giving him a minute by himself so that I don’t lose it. 4. Get a Helping Hand – my husband knows that mealtime is his gig. Whenever he’s around to help, he always takes over at meal time. He didn’t make the food so he’s not nearly as likely to get upset when he sees it hit the floor or get pushed away with an upturned nose. He has no emotional attachment to the food or how it was made so the relationship between the feeder and feed-ee is much more straight forward and less loaded. Plus it gives me a break and gives Daniel the opportunity to develop new approaches I’d never think of. He’s been able to interest Orion in eating by introducing the concept of a “monster bite.” Orion likes monster anything and can often be persuaded to take a bite or three, which will suffice. 5. Change Your Expectations – one of the biggest hurdles has been my own attitudes around food. In my mind a kid should love to consume food, especially if they nursed the way Orion did. But the fact of the matter is that some kids just don’t consume a lot of food. A friend of ours has a daughter who towers over Orion but often eats grapes and maybe a bite or two of bread for dinner. I don’t see them fighting with her over meals and its because they’ve decided she’s growing fine and knows best so they don’t make a big deal out it. This was a real game changer for me. Once I relaxed a let Orion eat the way he needed to eat, I’ve learned to let go of my frustration when he only has a few bites of a meal. It’s not a judgement on my cooking or some mystery about what he does or doesn’t like to eat. It’s just one of those days where he’s not very hungry. 6. Make What You Can Healthy – with a kid who doesn’t eat a lot, try to make sure that whatever they do consume is as healthy as you can make it. For example we can often get Orion to eat a few bites of a quesadilla so we make them on organic whole wheat tortillas. If he’s only going to eat a few crackers for lunch while throwing the rest, they might as well be almond crackers or another type with some whole grains. He also predictably eats fruit so we make sure the fruit is organic and seasonal so it’s as fresh as possible and provides as many nutrients as possible. He also has never eaten meat so we try to introduce whole milk organic cheese or beans/grains at every meal and/or always have cottage cheese and whole milk yogurt ready so that when all else fails, as long as we get a few bites of these healthy options in his mouth, we feel okay about the meal. 7. Try to Mastermind Snacks/Mealtimes – we found that snacks throw off any good meal plan. It took us a while to realize that on afternoons when Orion eats a mid day snack, say around 3, he’ll have a lousy dinner. This is a hard one because if your kid is the type of kid that goes ballistic if they’re hungry (which must be a genetic trait) then by all means you need to do what you can to get them to calm down. But try to offer milk instead. And offer water with meals instead of milk so they’ll consume their calories through the food instead of liquid sources. This takes some playing around but if your kid is struggling with meals, definitely give cutting out snacks a try. 8. Have a Back-up to Your Back-up – if there’s something you can count on your kid to 100% eat, then your one of the lucky ones. But if, like Orion, there’s no sure thing, then we have found it’s key to go into every meal with a back up and another back up. Orion is hungry so he has to eat something, it’s just a matter of happening upon the thing he feels like eating that day. Rather than scrambling through the fridge while your kid throws pasta at your head or turns his bowl of soup upside down on the table and pounds it, we have found that it makes us feel like we’re prepared for battle if we have two options ready to go and a third back-up that we know we can get him to eat a bite or two of before throwing in the towel. Like we mentioned in no. 6 above, we try to make this as healthy as possible. And the things we’ve had luck with are fruit, yogurt, cottage cheese, and eggs. We recently stumbled upon this recipe and had some success with it, and at the very least we enjoyed eating it. I’ve been fixated with the idea of fritters recently. There’s something about them that sounded so promising – crispy yet substantive, fried yet healthy with chunks of fresh veggies. I tried a number of combinations with varying degrees of failure before hitting on the key to fritters – their texture is what makes them successful and this is a result of the right binding agent and the right proportion of ingredients to binding agent. Ideally you arrive at a fritter that’s got the mass of a pancake but nice little crispy bits around the edges. I’ve found that egg is the most successful binder and that adding in some type of cheese that will melt and crisp up further increases the degree to which the fritter will keep its shape. We went with broccoli as the base because it’s a vegetable Orion was predictably eating, at least last week, and we added in red peppers for a little more depth in flavor. Roasted red peppers are something we always keep on hand to add to sandwiches, mix in with scrambled eggs, or add to round out vegetables in a frittata. 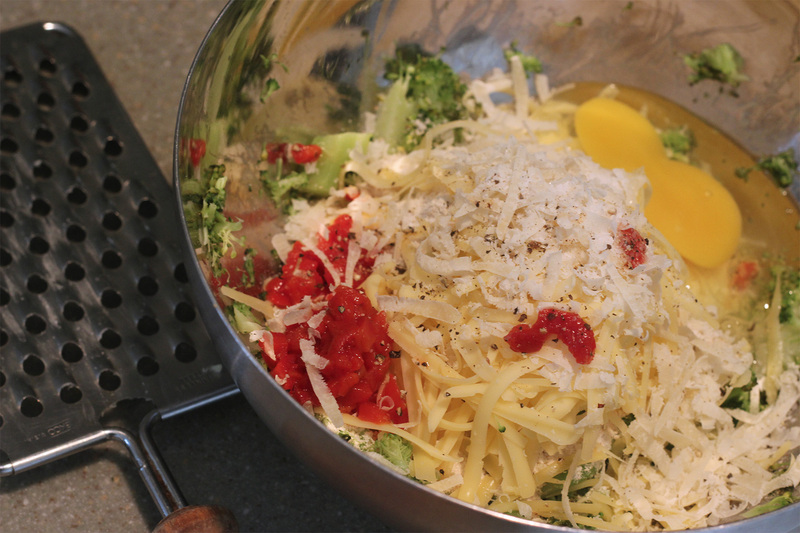 If you’re looking to make your own combinations, then we’d recommend starting with one egg, 1/2 a cup of flour and your favorite vegetable steamed so it can be mushed, and a handful of grated cheese. We tried chickpeas and zucchini with feta and carrots with cilantro. 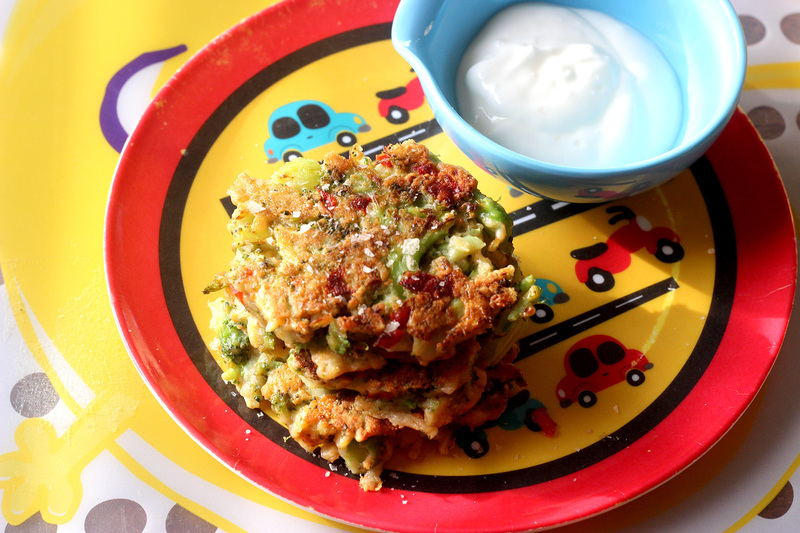 We’re enamored with these broccoli fritters but plan on trying different flavors in the future including the garlic, lemon and parmesan from this recipe that originally inspired us on smitten kitchen. We’re also hankering for more asian flavor pairings like with some grated carrot and ginger fried in sesame oil or peanut oil. We also contemplated trying them with dijon mustard, capers, a handful of herbs, and some red wine vinegar. The sky’s the limit. The good news is that at least one difficult toddler I know liked eating these and they were the perfect size for me to munch on. This recipe is perfect for a quick lunch or dinner that packs a nutritious punch with vegetables, whole grain flour, and protein-laced cheese and eggs. Use this recipe as a template keeping the binder of egg and flour the same and experimenting with other vegetables and flavorings swapped in. Make sure to add some cheese if you want crispy little edges to nibble on and for grown ups, finish with a sprinkling of sea salt. Serve with some garlicky yogurt sauce, stir in cucumbers and lemon juice for a nice finish. Chop the broccoli, separating the florets from the stem and cutting the florets into smaller pieces roughly around an inch in size. Peel the stem of the thick skin and chop it into inch to half an inch-sized pieces. Steam the brocolli in a steamer in a pan of water or in an inch of water in a pan. Add the stems first and after roughly a minute or two, add the florets. Cook until they are soft when pierced with a fork – roughly 3 to 5 minutes. Set aside to cool. Mix the egg in a bowl. Add to it the grated cheese, minced garlic, diced roasted red pepper, and salt. Mix with a fork. Then mix in the half cup of flour. In a separate bowl use a potato masher to mash the broccoli. You want to make sure there are some recognizable chunks but want enough of a mash so that the moisture is released and ingredients hold together. Stir the broccoli into the other ingredients with a spoon. Heat a tablespoon or so of oil in a medium hot preheated skillet, just enough to get a nice, even sheen of oil coating the pan. Scoop a large spoonful or so of batter onto the pan and form it into a patty. Repeat with several other patties depending on the size of your pan. Once brown underneath and able to flip without falling apart (about 2 to 3 minutes), turn the fritter with a spatula and press down on it to flatten slightly. Cook until the other side is the same color of golden brown. If the fritters have standing oil, briefly drain them by setting them down on paper towels. Repeat with remaining batter while keeping fried fritters warm in a an oven. We served them with yogurt, what else! Yum! These look like a perfect way to get out of the rut that I’ve been wallowing in!